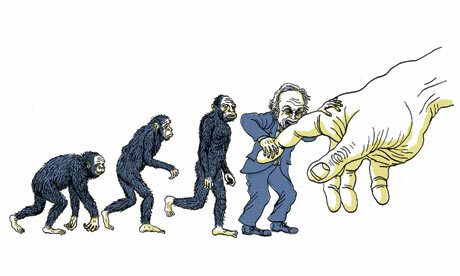 In his earlier book, The Ancestor’s Tale (2004), Dawkins traced human ancestry back to the dawn of life. Cool story, bro, but where’s the evidence? To answer the question, Dawkins wrote The Greatest Show on Earth. The book is subtitled The Evidence for Evolution and that’s why I’m reading it. So far I’ve read only the first paragraph of the Preface, and it’s not off to a good start. THE evidence for evolution grows by the day, and has never been stronger. At the same time, paradoxically, ill-informed opposition is also stronger than I can remember. This book is my personal summary of the evidence that the ‘theory’ of evolution is actually a fact – as incontrovertible a fact as any in science. In order for a theory to even be counted as a scientific theory it must be controvertible, i.e., falsifiable. If it’s not falsifiable, then it’s not scientific. An incontrovertible theory is not a scientific theory. It is pseudo-scientific hocus pocus. So say I – a good Popperian. I’ll report back on the rest of the book when I’ve read it. Meanwhile, philosopher Thomas Nagel has a new book out. It’s called Mind and Cosmos: Why the Materialist Neo-Darwinian Conception of Nature is Almost Certainly False. Worth a look inside! Here’s Amazon’s book description. Not bad for an atheist, huh? Previous PostPhillip E. Johnson on DarwinismNext PostThe Ozzman Cometh!